One Normandy veteran, Eric Goldrein from Liverpool, recalls taking singlehandedly the surrender of a German troop, part of a fierce enemy resistance force against the allied invasion. Eric volunteered for service in 1939 aged 18 years old. However, he was due to take his place at Cambridge University so the Recruitment Board advised him to go off to University for two years and then join up later. But after 1940 when things started going badly, Eric decided to join the OCTU – Officer Cadet Training Unit. Joining the 11th Armoured Division Anti-Tank Regiment, Eric spent months in landing practices and manoeuvres across the Yorkshire moors. “We had been training for so long, I certainly had a sense this was a momentous historical event in the making. The main body of my Division went on the first day, although I didn’t get there until D-Day + 4, landing on Gold Beach in King Sector. I walked down the ramp of the LTC. The immediate danger on the beach itself had passed, but all around were the sounds of shellfire and mortars. Eric was a lieutenant in command of a troop of four artillery pieces which comprised 17 pounder Anti-Tank Guns, each with a 12 ft long barrel. Formidable in the field, each gun could fire an armour piercing shell with a muzzle velocity of 3,000 feet per second and knock out a Tiger Tank at a range of 800 yards. Having been on the ground in France for over seven weeks, Eric and his gunners had experienced tough fighting all the way from the beaches. In the aftermath of D-Day the German High Command recovered from their initial confusion, and resistance became resourced, disciplined and fierce with the Germans taking natural advantage of the high hedgerows, earth embankments and woodland of the Normandy countryside to defend their positions. It was during this period on 1st August that Eric fell into enemy hands after he and his driver went out in a Jeep across German lines on a reconnoitre to find new gun positions. As the Colonel was taking serious casualties and his defences were steadily weakening with British and Allied troops pouring into Normandy, Eric eventually managed to persuade him to surrender. “Then of course there was the practicality of who would take the surrender. I heard myself saying: ‘Don’t worry about that; surrender to me’. When I think back, it’s such a surreal scene. I had my right arm in a sling so couldn’t salute. I had no experience of taking surrender, at the ripe old age of twenty-three! “We set out at first light with me at the front, the Colonel and his Adjutant alongside, followed by 35 other ranks. In proper military order we marched along the narrow road, heading north towards the coast. Quite soon I heard tracked vehicles and we came upon a forward carrier patrol of the 1st Worcester Regiment. “The patrol consisted of three Bren carriers and I put one at the front and one bringing up the rear of our small column. I travelled in the third vehicle along with my two captive officers. Before long we reached a main HQ assembly area where I was able to leave my group and report to the MO in a tented area. Once there, and in good hands, I promptly passed out. Len Burritt, 92, will journey to Egypt later this year to visit some of the places that he served in with the 7th Armoured Division – known historically as the ‘Desert Rats’. This legendary division fought in every major battle during the North African Campaign and helped swing the war, at a pivotal point, in the Allies favour. After joining the army at the age of 18 in 1936, he formed part of a Wireless troop controlling communications for a new formation to be known as The Mobile Desert Division (Egypt) – later renamed the 7th Armoured Division. He recalls: “I joined the army at a young age but I wasn’t particularly nervous about the prospect of doing so. I’d worked all my life on farms and wanted a change of scenery, so at that age, when you felt as though you’re ready to take on the world, worry didn’t really come into it. Len worked from Armoured Command Vehicles (ACVs) – the nerve centres for the Division, positioned just behind the forward troops. As he mentions, in many of the battles that he saw action, there was no ‘front line’ as such and elaborate camouflage was often needed to divert enemy attention away from their vital radio equipment. On many occasions he accompanied his commanding officers deep into raging battles, travelling in the relative ‘safety’ of their personal armoured cars. They would do battle with the elements as well as the enemy, and after one ferocious sandstorm Len found he had sand trapped behind his eyes which meant a lengthy operation and two weeks in cumbersome bandages. 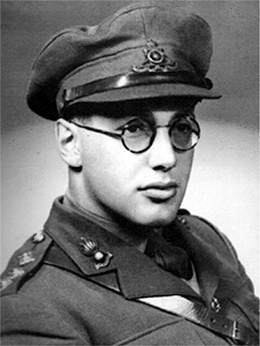 As well as being an expert in communications, relaying accurate Morse Code messages in cramped, sweltering conditions, Len was also trained in the use of the Bren guns and anti-tank weapons mounted on his armoured vehicles – his teacher being Major Gott, who later became a renowned lieutenant general. In close combat with both German and Italian forces, Len recalls a particularly bizarre attack by a low-flying plane. 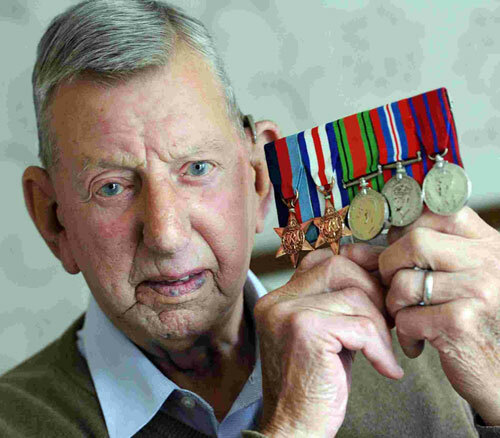 Surviving the desert’s inhospitable conditions, Len landed on the Salerno beaches during the invasion of Italy and the Normandy beaches during the D-Day Landings (6 June 1944). 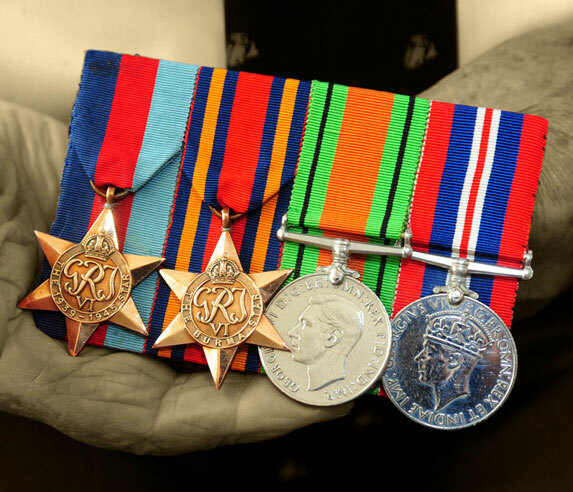 During the war he rose to the rank of Sergeant Major and was involved in over 100 front line battles in 15 different countries before being demobbed in May 1946. During his journey back to Egypt, Len will visit memorials and cemeteries marking the sacrifice made by those who fought and did not return from battle. He will also visit some of the places in which he was stationed. The Big Lottery Fund is committing over £1 million in extra good cause funding in the year ahead for the country’s WWII veterans so they can make battlefront commemorative journeys to the places they saw action. The additional funding comes on the day BIG named the 50,000th individual to benefit from the Heroes Return grant scheme – 91-year old Gordon Mellor, a former RAF bomber command navigator. Gordon Mellor is awarded a grant to fund the visit he made to pay his respects to those of the fabled Comete resistance group who helped him escape across Nazi-occupied Belgium and France and over the Pyrenees into Spain. Serving with Bomber Command 103 Squadron, Gordon aged 22 was shot down in November 1942 while his Halifax bomber was returning from a raid over Germany. Gordon’s long journey took him through Belgium, France, over the Pyrenees and then took him to Bilbao, Madrid and finally Gibraltar where he was flown back to Britain in a Dakota. Fred Burton returns to Monte Cassino with his family, read the article in Wales Online to find out more.